World's Best Cat Litter™ helps you avoid breathing or cleaning up dust. Our scoopable cat litter for multiple cats litter is made with a patented process that forms compact granules that don't create a cloud each time you open the bag or pour it in the litter box. World's Best Cat Litter™ traps the liquid and limits the wetness from seeping, sinking to the bottom or sticking to the sides of the box. Because World's Best Cat Litter™ is made from all-natural ingredients—with no added chemicals—it's safe for cats. And unlike clay litters, there's no silica dust for you or your cat to breathe. World's Best Cat Litter™ is proud to offer you the choice of using more environmentally friendly cat litters for multiple cats. All of our 100% natural and renewable litter formulas offer an eco-friendly alternative to regular cat litter. 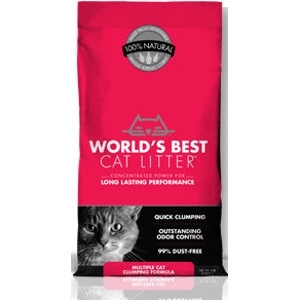 World's Best Cat Litter™ isn't made from mined, drilled, or artificially made ingredients. It's milled from renewable whole-kernel corn and other plant materials grown on American farms.